Happy Friday! I hope you've had a great week! This has been such a busy week here adjusting to so much newness in our schedule and routine but we made it! However, I am really looking forward to catching up on some sleep tomorrow morning. I definitely could use some extra rest this weekend! Our town's annual fall festival is this weekend and it's always one of the highlights of the fall season... I just wish it was going to be just a little bit cooler so that it actually kinda sorta felt like fall this year, lol. Cheesecake on a stick, here I come! Today, I'm sharing my weekly roundup of what I'm currently loving/my weekly opportunity to share a new leopard item with y'all! Leopard is taking over my wardrobe this season! 1. M O C K N E C K T O P | I got this top in the mail recently and it's such a great closet staple plus it's only $13. I plan to wear it with shorts this weekend since it's still summer here. 2. K I T T E N H E E L M U L E S | How cute are these shoes?! I am loving mules and I love that this pair gives you a little bit of height without being too tall for everyday wear. These would look super cute with a dress or jeans. I love them and they are also budget friendly! 3. L E G G I N G S | I want to live in these leggings! They are a mix between a legging and a jogger so they are basically pant perfection. Plus, they have pockets! The fit is true to size. 4. C A R D I G A N | Hello, perfect leopard cardigan. I have been on a serious hunt for a great leopard cardigan for fall and winter. My search is over because this one is amazing! So super soft! The fit is true to size but I sized up to a medium for a more cozy feel. 5. W A F F L E T E E | I cannot get enough stripes! This waffle tee is such a great basic for layering. It was would super cute paired with a vest or cardigan. 6. 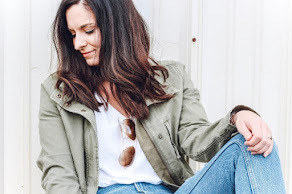 J E A N S | Another item that I have been hunting for is a great pair of dark denim skinny jeans that have a high rise and no distressing (so that they are work friendly). Well, I found them! These are such a great pair and have just enough stretch to make them comfortable to wear without getting baggy. The fit is true to size and I got the regular length (I'm 5'5"). If you are hesitate to pay $70 for jeans, don't forget the cost per wear equation. Think about how much you would wear a great basic pair of good quality denim. For me, I plan to wear this at least once or twice a week! 7. N E C K L A C E | I think I've had my eye on this necklace for a year and I am still loving it. I just need to go ahead and add it to the cart! 8. S W E A T E R | This gorgeous dark pink color is my favorite for fall! I love bringing my favorite color into the cooler months and this rich pink is perfect. I also always love a cozy sweater! Thanks so much for visiting today! I hope you have a great weekend!